The 2018 Dodge Challenger combines the sleek muscle-car flavor of a V8-powered 2-door coupe with the surprising utility of a 5-passenger car. Comfortable and quiet, especially in V6 models, the Challenger is thoroughly modern despite its retro styling. Yet with various V8 models available -- including the 707 horsepower Hellcat -- the Challenger takes no prisoners against its Ford and Chevy competitors. Beautiful car new tires great fast performance acceleration from 0 to 60 mph in 2 seconds, the sound of engine is loud outside but inside it sounds dull - it is kind of loud too a little annoying the engine is aggressive. Computers onboard have been upgraded. There is an indicator of a car in the blind spot. Comfortable seats but uncomfortable for long distance 3 hrs. drive. Smell of new rudder and fabrics is unbearable for first 3 weeks later is ok. Car is fun fast and stands out. It has radio in built and GPS but does not CD player. It has automatic gear very fast cooling cold ac and darkened windows. V8 model, grippy summer tires, upgraded brakes are outstanding. The brake pedal feel is medium- firm and well-suited to everyday driving. During panic- stop testing, the portly challenger needed just 104 feet to stop from 60 mph. This is a great results, but keep in mind it had the benefits of summer tires. The challenger has decent small-item storage all around, and the moderately sized center console is useful for holding a variety of items. 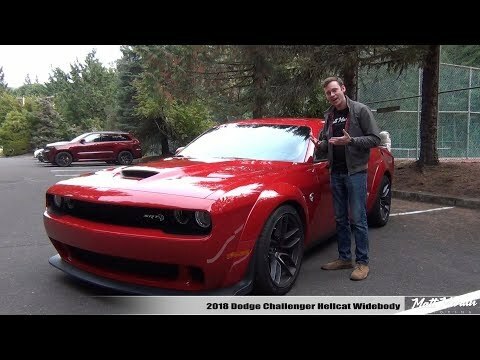 My 2018 Dodge challenger is smooth, fast, and comfortable. My Dodge challenger drives very smooth and comfortably. Compared to my past cars it is better on gas mileage. The oil life also lasts pretty long and it tells you at what percentage your oil life is at so you know when you are getting close to empty. The only bad thing about it so far is sometimes I do not realize how fast I am going since it does drive so smooth.